There has always been a road that runs right round the island. For many years the stretch from L’Anse Fourmi on the Northern coast to Charlotteville on the North Eastern tip of the island was in very poor condition and really only suitable for walking. Now however things have changed and you can drive right round the island from Crown Point to Charlotteville. Leaving Crown Point you can take the main road to the Highway and then follow this until it become a normal road again at the village of John Dial. After this the road wiggles and winds its way through the villages, past the beaches of Hope and Studley Park, and on until you come to Roxborough. From here to Kings Bay the road runs uphill and down, but after Pedros Point the road begins to climb and wiggle steeply until you get to the look out point overlooking Speyside and the islands off the coast. Downhill, steeply from here and you get into the village of Speyside, which is built along the edge of the sea with the road running more or less along the beach. The road again starts to climb when you pass the road off to Blue Waters Inn. Again climbing steeply through woodlands, this has to be the prettiest section of the whole drive. Here there are none of the steep drop off's that you will have witnessed on the road to Speyside! And then, at the top you start to come down, definitely the steepest part of the whole drive. The views of Charlotteville and Man O’War bay are spectacular, for the driven NOT the driver whose whole attention must be given to the steep and winding road! At the bottom of the hill there is a junction, to your right is Charlotteville, straight ahead the sea and to the left the road back along the North coast, the Northside road. The road back winds its way uphill and then goes up and down for some miles taking about 30 plus minutes to get to L’Anse Fourmi. The road from Bloody Bay goes uphill and you must keep a look out for the right turn (sign posted) to take you back to Scarborough. Straight ahead and you cross the rain forest and come back to the Windward road the way you came. The road runs downhill to Parlatuvier with its waterfalls and jetty, then up and over the hill and down to Englishman’s bay. Here you can see the houses being built in the middle of the forest with their gardens and their views! After Englishman’s bay is Castara and then on with coastal views to Runnymede and Moriah. If you continue straight here you end up back at Scarborough. Taking the right turn at the top of the hill in the village takes you along the coast to Culloden and into Les Coteaux. Here again there are choices, at the T junction by the cellular phone mast you turn right and then follow the road uphill, winding its way to Mt. Thomas. The left fork here brings you back to the Plymouth road into Scarborough. The road to and from Mt. Thomas is narrow but in good condition. It passes through Table Piece with its large flat games’ field, past the Waterwheel restaurant, past Arnos Vale Hotel and into Plymouth. Turn left at the T junction and you cross the new bridge and meet up with the Shirvan Road that will take you back to Scarborough if you turn left or Crown Point if you turn left. 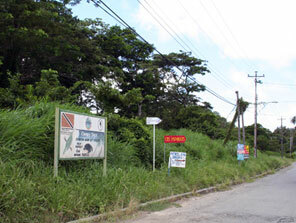 Turning left takes you past all the best of the Caribbean beaches such as Mount Irvine. The road eventually ends at a T junction on the Highway just before Canaan, and back to Crown Point.